Engineer Colin Chapman wanted to design lightweight sports cars with great handling. In 1952 Lotus was founded in England and the rest is history. Lotus cars are excellent at what they are designed to do – be light, quick and nimble. Lotus manufactures sporty coupes and convertibles that look great and perform like no other. 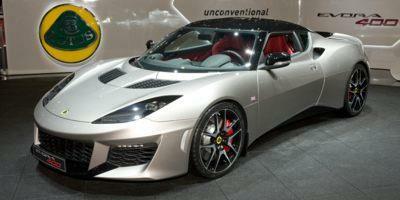 The Evora 400 is Lotus’ newest supercharged roadster.